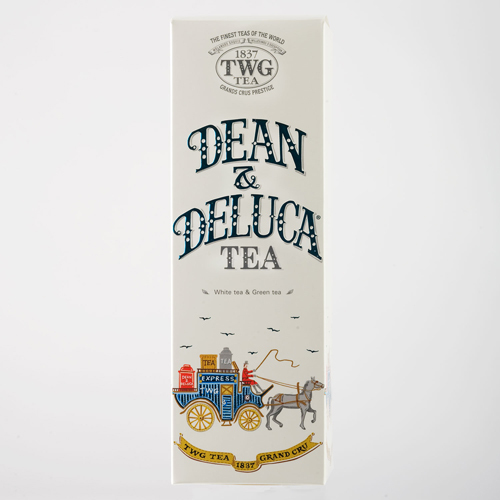 [prodDesc] => DEAN & DELUCA and TWG of Singapore have produced our exclusive signature tea, redolent of a cottage garden. DEAN & DELUCA tea is a blend of white and green teas, delicate linden flowers, heady rose petals, lemon verbena with the aromas of summer fruits. Astringent and complex, as warming and as fragrant as an evening in June. [prodDesc] => The one that started it all, our signature Tate's chocolate chip cookie is just as delicious as it was back when our bake shop first opened in Southampton, NY in 2000. Crisp, buttery, and unforgettable, you'll know with just one bite why these delectable treats were voted the #1 chocolate chip cookie in America. Yum! [prodDesc] => If chocolate lovers needed a reason to celebrate, this is it! Our double chocolate chip cookie is simply divine. We've loaded tons of semi-sweet chocolate chips inside a fresh-baked, rich and dense dark chocolate chip cookie. If there's a stairway to chocolate heaven, the steps are sure to be crowded with this cookie! [prodMetaDesc] => semi-sweet chocolate chips inside a fresh-baked, rich and dense dark chocolate chip cookie. [prodDesc] => The great taste of Tate's meets a classic cookie and the result will remind you of home! Our fresh-baked oatmeal raisin cookies are full of plump, juicy raisins and a hint of cinnamon for a scrumptious favourite that tastes like it just came out of Mom's oven. Baked to a perfect crunch and ready to make any day delicious. [prodDesc] => Everyone is falling in love with the newest member of Tate’s cookie family! Tiny Tate’s are a bite sized version of our famous thin, crispy chocolate chip cookie in a handy single serve package. They’re a great anytime snack and are just about perfect tucked into a lunch box! DEAN & DELUCA and TWG of Singapore have produced our exclusive signature tea, redolent of a cottage garden. DEAN & DELUCA tea is a blend of white and green teas, delicate linden flowers, heady rose petals, lemon verbena with the aromas of summer fruits. Astringent and complex, as warming and as fragrant as an evening in June.